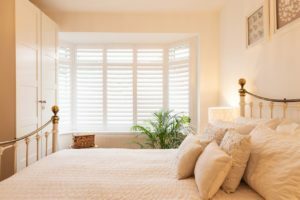 Leatherhead shutters by Just Shutters – the undisputed experts! The team, all local to the Surrey area, understand the interior design trends that your home deserves! Give your home an on trend stand out feature with plantation shutters by Just Shutters. Contact the team on 01932 500270 or alternatively us the buttons below. The Leatherhead shutters specialists are Simon and Georgina Broadhurst – the MDs of Just Shutters Surrey. The are both incredibly passionate about interior design, loving noting more than seeing how delighted customer are with new stunning shutters. Therefore, you can rest assured that the team will strive to provide you with beautifully bespoke shutters than compliment the décor of your home. Not only are our shutters stunning, they are also incredibly practical! This practicality comes as a result of the variety of unique features they boast! From being child friendly to easily cleaned, it is no wonder why they are so in demand! Get in touch with the team to find out more – watch the video below to get to know your experts a little better!